I recently acquired my very own copy of Low Carb is Lekker. Wow, what a fantastic recipe book. Truly South African, and a pleasure to read. For me, recipe books only ever get well-used if the recipes are delicious, are effortless to create, and if all the ingredients are easily available. Low Carb is Lekker ticks all my boxes. The book’s author, Inè Reynierse, is a mom and wife, who is doing her best to make sure her family eats healthy, to stay healthy. In the Introduction she openly shares how an LCHF way of eating benefitted her, and her family. This recipe book was born out of her desire to share this amazing way of eating with others, in a simple and easy to understand way. Like many of us moms who have “seen the light”, getting healthy means cutting out all sugar, grains, vegetable oils and processed food. This can get overwhelming when it comes to hosting dinner parties, kiddie birthdays, or even just what to put in the lunch boxes every day. Inè gives us a helping hand, and some fabulous ideas. Besides awesome recipes, she also provides context and theory to the food she loves to create. Inè explains why low carb is a healthy way of eating, why sugar is so bad for us, why grains and legumes should be avoided, and why you need to look after your gut flora. She then very eloquently gives practical tools and advice on how to implement this way of eating. Clever substitutes for things like sugar, honey, wheat, mashed potato, and breakfast cereals are discussed. Have you been wondering how to make a cheese sauce without using flour as a thickener? This book has the answer. One of the messages that came through clearly for me is that LCHF is for the whole family. Everyone can benefit. Getting healthy is so much easier when the whole family is onboard. If you have allergies to dairy, nuts or eggs – she provides alternatives that can be used. No-one has to miss out on this delicious way of eating. When following an LCHF eating plan, many people struggle with what to have for breakfast, especially if eggs and bacon don’t float your boat. Here is a taste of some of the recipes on offer: Cinnamon Crunch, Creamy Porridge, Almost Instant Breakfast cereal, Blueberry Muffins, Pancakes, Savoury Muffins, Breakfast Buns, Breakfast Pizza and Wraps – not to mention the smoothie options too. If you are weaning your baby onto solid foods, you will find her suggestions very helpful. There are enough ideas here to stay well clear of rice cereal, and sugary baby porridge. Low Carb is Lekker offers up a smorgasbord of traditional South African dishes that have been “de-carbed”. Think curry, bobotie, lamb shanks, chicken pie, waterblommetjie bredie, Cape Malay roast chicken, pickled fish, paptert, chutney, and braai marinade. My mouth waters at all the beautiful photos. For a more exotic culinary experience you can try the Moroccan lamb, Thai chicken curry and pumpkin gnocchi with a bacon, sage and cream sauce – oh my goodness, that one looks amazing! I love the fact that she has included desserts and sweet treats. You can enjoy malva pudding, carrot cake, milk tart, chocolate brownies, rusks, scones and much, much more. I personally don’t think that sweet treats (even Banting-friendly versions), on a regular basis is helpful when trying to lose weight. But, when cooking for friends and family, it is nice to be able to show them that Banters don’t live miserable, deprived lives, devoid of “sugar and spice and all things nice”. I often hear, ” … but drinking water all the time is so boring.” It is true, some people really struggle with drinking plain water day in, and day out. Inè gives some wonderful recipes for cordials and syrups, which will “jazz” up a tall glass of sparkling water. You could almost convince yourself that you are holding a cocktail in your hand…. except that it won’t have any alcohol in it (because we know that alcohol stops fat-burning in it’s tracks). In that case, think “virgin” cocktail. Add an umbrella, and a sprig of mint, and your imagination won’t have to overtax itself. For those that can’t resist, she even explains how to make a Banting-friendly hot toddy. Here is some exiting news: The Afrikaans version is being released this month (July 2015). 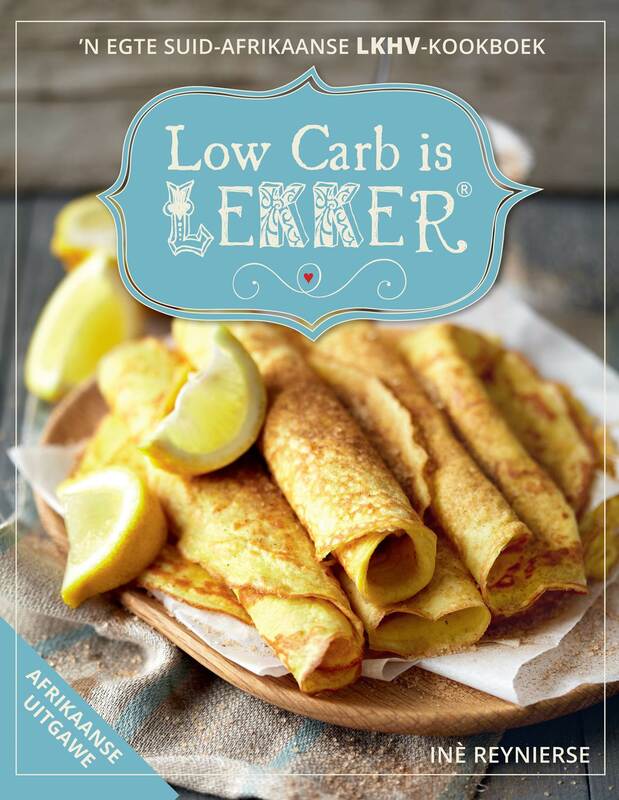 So, if you are looking for an LCHF recipe book to add to your collection, then I can highly recommend Low Carb is Lekker. Delicious recipes, great information, and creative ideas. All the right ingredients for a happy, healthy family. Preheat the oven to 180 °C. For the crust, mix the flour, coconut and xylitol together in a mixing bowl. Pour over the melted butter and mix in. Press the dough onto the base of a buttered dinner plate-sized ovenproof dish. Alternatively, I would suggest you use 4 single-serving ramekins or 8–10 cupcake moulds. For the filling, heat the cream, salt, xylitol and stevia in a heavy-bottomed saucepan on medium heat. Give the egg yolks a quick whisk and stir into the cream while it is still lukewarm. Stir constantly. As soon as the mixture starts to thicken, stir in the butter and vanilla and remove from heat. Whisk the egg whites and psyllium for about 30 seconds until foamy and almost doubled in volume. Fold the egg white mixture into the custard mixture and then pour the custard filling over the crust. 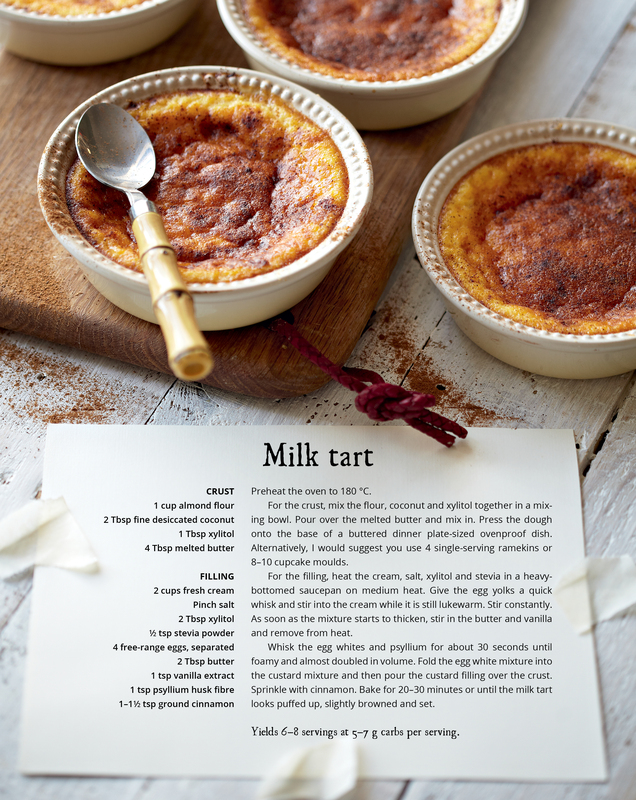 Bake for 20–30 minutes or until the milk tart looks puffed up, slightly browned and set. Yields 6–8 servings at 5–7 g carbs per serving. Posted on July 17, 2015, in Primal 101 and tagged Banting milk tart recipe, Banting recipe book, LCHF milk tart, LCHF Recipe Book, Low Carb is Lekker, low carb recipe book. Bookmark the permalink. 4 Comments. I enjoy following her blog although I haven’t seen a post in awhile. Hi there! If following the recipes in Inè’s book – how many carbs is one allowed per day? Don’t seem to be able to find the answer in her book! Hi Jeanine, the amount of carbs one can consume (and lose weight) will depend on how insulin sensitive or carb tolerant you are. If you want to aim for ketosis then keep net carb grams between 25 and 50. If you drop you carbs to ketogenic levels for maximum fat-burning, then please remember to up your fat intake significantly to around 120 grams per day. If you don’t you will feel tired and might experience hormonal imbalances.